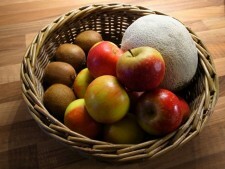 Here are some of our customer’s feedback and a few photographs of their baskets at home. For more customer photographs, please see the gallery page. communications. It’s been a pleasure dealing with you. Just a quick note to say the basket arrived yesterday and looks absolutely beautiful. such a lovely looking piece of handiwork. Today I received Virgil’s new creation and I can’t tell you how happy I am with it. Thank-you both SO much, it totally surpassed all my expectations, it is utterly perfect. they look fab. We love them. Dear Alison, We are pleased to report that the baskets arrived yesterday afternoon, what an excellent service from one end of the country to the other ! The parcel was well wrapped and the baskets are exactly what we were hoping for, the colour and size fully matching our expectations. 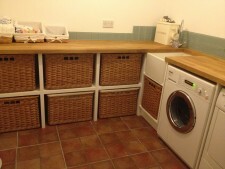 The baskets fit the kitchen unit and maintain the look of a traditional country kitchen. We are so pleased with the service we have received, your prompt response to our first enquiry and keeping us updated on progress has been excellent. 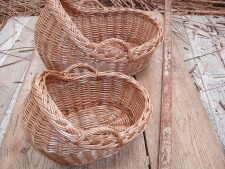 The baskets are very well made so many thanks to the craftsperson who made them. Thank you so much – I am really pleased truly. Will definately come back again in the future. The trays arrived yesterday safe & sound. They are beautifully made and the perfect size. to her today and I am sure she will be as delighted as I am. These will be put to good use! I can’t tell you how lovely the Moses basket is! My daughter has now (sadly) grown out of it. and it is still in my bedroom as I am not yet ready to put it away. We love our new baskets and they add just the perfect touch to our built-in cabinet. into our new cabinet, and I am so very glad that I found you online. that we couldn’t be more pleased with his craftsmanship and creativity. (just like the previous ones) fit perfectly and are beautiful! I really can’t thank you enough, ordering from you has been an absolute pleasure. 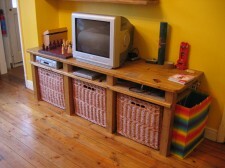 Just to let you know that the baskets arrived today and I am delighted! They are fabulous and perfect. Thank you for your help with my order. The baskets have just arrived and they are fantastic! They fit perfectly and look great. Thank you so much. The baskets have arrived today, they are perfect, thank you so much. also the service I have received. exactly the size I want. It looks good by my log burning stove. Our basket arrived today as you said it would, beautifully packaged and in perfect condition. Thank you so much – it is really lovely and fits perfectly next to the fireplace and looks great. Just to let you know that the Log Basket is superb. It looks perfect in the hall and was immediately filled with logs. 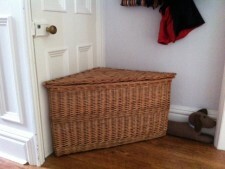 … my basket arrived today and I am absolutely delighted with it. It is wonderful and just what I wanted size wise for my walking sticks and fishing rods. Thanks very much Alison, the basket is absolutely perfect! 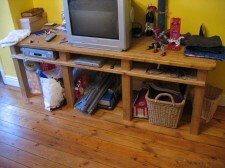 Customer’s photograph of storage unit…. I got my custom made wicker basket today and it’s absolutely beautiful. Thank you so so very much! It’s just gorgeous…. it was worth the wait! The baskets arrived today and look amazing and fit into the spaces perfectly. advice and great service. I will definitely be recommending you to friends. and also for the brilliant service (fast responses, excellent communication etc). exactly what I wanted Thank you very much indeed. They fit perfectly under our bed and look lovely. Huge HUGE thanks. The basket arrived safely, beautifully wrapped as before. your care, the standard of work and efficiency. Thank you again. P.E. Just received the baskets and I can’t tell you how overjoyed we are! Everyone is marvelling at the craftsmanship, the quality and the sheer loveliness of them. For our mums and dads who lose babies very early and up to mid way in the pregnancy, these will be perfect for allowing us to provide memories and photos of their babies in comfort and dignity, such a precious gift. Thank you again and I know where to come in the future! business and if we ever have any queries re baskets I will definitely recommend you. I’m very pleased with the baskets – thank you very much. They are just perfect for fitting into the unused wine rack. Thank you for such good service and lovely workmanship. him to be quite so enthusiastic, but he’s over the moon by the change! Hi Alison, I have the basket safely and it’s fantastic. Thank you very much indeed. my husbands bed to put all his books wallet phones laptop etc in to keep the room tidy. Hi Alison & Virgil The basket arrived today, thank you. My wife thinks it’s beautiful & so do I.
Hi Alison, All the baskets have now arrived safely, many thanks.